Iris melanosis is a feline-specific condition where the iris becomes pigmented. The pigment is a result of melanocytes, or pigmented cells, inappropriately replicating and spreading over the iris surface. 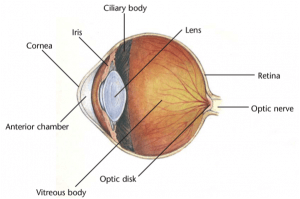 Iris melanosis is benign, but it can transform into malignant cancer. It should therefore be monitored closely by your family veterinarian and veterinary ophthalmologist. In many cases the pigment first appears as a small, flat and benign nevus, or “freckle,” on the iris. Benign iris pigment is termed “iris melanosis,” which may stay benign for many years, but does have the potential to spread unpredictably. Spreading iris melanosis can lead to secondary ocular complications such as glaucoma and retinal detachments. More importantly, the spreading melanocytes can become so aggressive that they transform into cancerous cells called malignant. Malignant melanoma can spread to other organs such as the liver and lungs and is potentially fatal. Despite researchers’ best efforts, we do not yet have a way to definitively identify when benign iris melanosis is about to transform into malignant melanoma. Most ophthalmologists do, however, consider the following signs “clues” that the pigment is becoming dangerous: rapid pigment spread or thickening and pigment reaching the very outer edge of the iris. If these signs are noted, your ophthalmologist may recommend enucleation (eye removal). Though controversial, enucleation may minimize the chance that your pet has metastasis (tumor spread) to other, more vital organs. Some ophthalmologists recommend laser therapy – targeted destruction of the iris melanosis – in early stages of the condition. The goal of this therapy is to prevent or delay the transformation of iris melanosis to malignant melanoma. Though many ophthalmologists think laser therapy can be helpful, it has not yet been proven by a large-scale scientific study. Each case of iris melanosis is different. Your veterinarian and veterinary ophthalmologist can help you decide what treatment approach is appropriate for your pet. For more information on this subject, speak to the veterinarian who is treating your pet.